PuTTY is a terminal emulator with a free software license, including an SSH client. While it has cross-platform ports, it’s used most frequently on Windows systems, because they otherwise lack a built-in terminal emulator that interoperates well with Unix-style TTY systems. While it’s very popular and useful, PuTTY’s defaults are quite old, and are chosen for compatibility reasons rather than to take advantage of all the features of a more complete terminal emulator. For new users, this is likely an advantage as it can avoid confusion, but more advanced users who need to use a Windows client to connect to a modern GNU/Linux system may find the defaults frustrating, particularly when connecting to a more capable and custom-configured server. It identifies itself as an xterm(1), when terminfo(5) definitions are available named putty and putty-256color, which more precisely define what the terminal can and cannot do, and their various custom escape sequences. 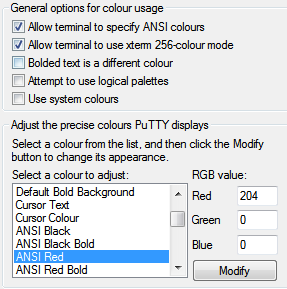 It only allows 16 colors, where most modern terminals are capable of using 256; this is partly tied into the terminal type definition. It doesn’t use UTF-8 by default, which should be used whenever possible for reasons of interoperability and compatibility, and is well-supported by modern locale definitions on GNU/Linux. It uses Courier New, a workable but rather harsh monospace font, which should be swapped out for something more modern if available. It uses audible terminal bells, which tend to be annoying. Its default palette based on xterm(1) is rather garish and harsh; softer colors are more pleasant to read. All of these things are fixable. Usually the most important thing in getting a terminal working smoothly is to make sure it identifies itself correctly to the machine to which it’s connecting, using an appropriate $TERM string. By default, PuTTY identifies itself as an xterm(1) terminal emulator, which most systems will support. However, there’s a terminfo(5) definition for putty and putty-256color available as part of ncurses, and if you have it available on your system then you should use it, as it slightly more precisely describes the features available to PuTTY as a terminal emulator. Here, I’ve used putty-256color; if you don’t need or want a 256 color terminal you could just use putty. If Unicode and its various encodings is new to you, I highly recommend Joel Spolsky’s classic article about what programmers should know about both. There’s no reason you can’t use another favourite Bitmap or TrueType font instead once it’s installed on your system; DejaVu Sans Mono, Inconsolata, and Terminus are popular alternatives. I personally favor Ubuntu Mono. Given the purpose of the alert is to draw attention to the window, I find that using a flashing taskbar icon works well; I use this to draw my attention to my prompt being displayed after a long task completes, or if someone mentions my name or directly messages me in irssi(1). 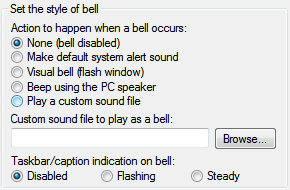 Another option is using the Visual bell (flash window) option, but I personally find this even worse than the audible bell. The default colours for PuTTY are rather like those used in xterm(1), and hence rather harsh, particularly if you’re used to the slightly more subdued colorscheme of terminal emulators like gnome-terminal(1), or have customized your palette to something like Solarized. There are a few other default annoyances in PuTTY, but the above are the ones that seem to annoy advanced users most frequently. Dag Wieers has a similar post with a few more defaults to fix. This entry was posted in PuTTY and tagged 256, client, configuration, font, utf-8, windows by Tom Ryder. Bookmark the permalink.